July 6, 2017 – ESA’s Mercury spacecraft has passed its final test in launch configuration, the last time it will be stacked like this before being reassembled at the launch site next year. 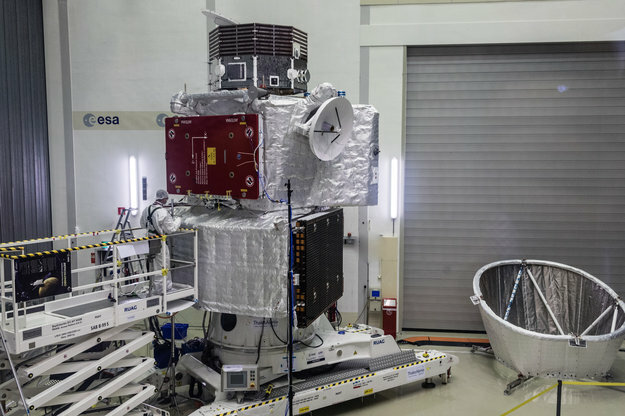 BepiColombo’s two orbiters, Japan’s Mercury Magnetospheric Orbiter and ESA’s Mercury Planetary Orbiter, will be carried together by the Mercury Transport Module. The carrier will use a combination of electric propulsion and multiple gravity-assists at Earth, Venus and Mercury to complete the 7.2 year journey to the Solar System’s mysterious innermost planet. Once at Mercury, the orbiters will separate and move into their own orbits to make complementary measurements of Mercury’s interior, surface, exosphere and magnetosphere. The information will tell us more about the origin and evolution of a planet close to its parent star, providing a better understanding of the overall evolution of our own Solar System. The two orbiters will explore Mercury for one Earth year (4 Mercury years), with the option of a one-year extension. 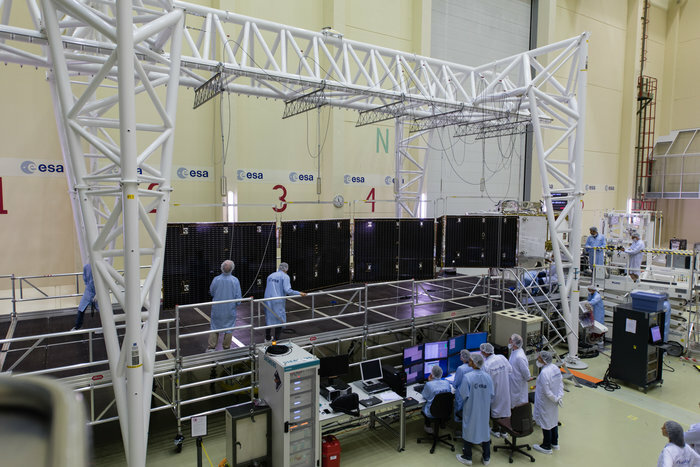 One set of tests carried out earlier this year at ESA’s technical center in the Netherlands focused on deploying the solar wings, and the mechanisms that lock each panel in place. The 7.5 m-long array of the Mercury Planetary Orbiter and the two 12 m-long array of the Mercury Transport Module will be folded while inside the Ariane 5 rocket. In the coming weeks the assembly will be dismantled to prepare the transfer module for its last test in the thermal–vacuum chamber. This will check that it can withstand the extremes of temperatures en route to Mercury. The final ‘qualification and acceptance review’ of the mission is expected for early March. Then BepiColombo will be flown to Europe’s Spaceport in Kourou, French Guiana, in preparation for the October 2018 departure window. The date will be confirmed later this year. BepiColombo is a joint mission of the European Space Agency (ESA) and the Japan Aerospace Exploration Agency (JAXA). The Southwest Research Institute (SwRI) provided Strofio, a unique mass spectrometer that is part of the SERENA suite of instruments. Strofio will determine the chemical composition of Mercury’s surface, providing a powerful tool to study the planet’s geological history. Dr. Stefano Livi of SwRI in San Antonio, Texas, is the Principal Investigator for Strofio.